The term "rivers and streams" refers to all bodies of running water, from large rivers down to small rills, that flow under the influence of gravity to progressively lower elevations in a relatively narrow, but clearly defined, channel. Oklahoma's major drainage systems consists of a principal river with a large number of smaller tributary rivers, streams, and creeks that funnel into it. Major drainage systems of today were initiated during the Pleistocene Epoch of geologic time (the last 1.65 million years, or so). Streams did flow across Oklahoma for many millions of years before that time, of course, but they began carving today's drainage basins during the Pleistocene. The shifting early positions of these streams within their drainage basins are now marked by old alluvial deposits that were left as terraces, high above the current flood plains, as the streams eroded deeper into the earth. 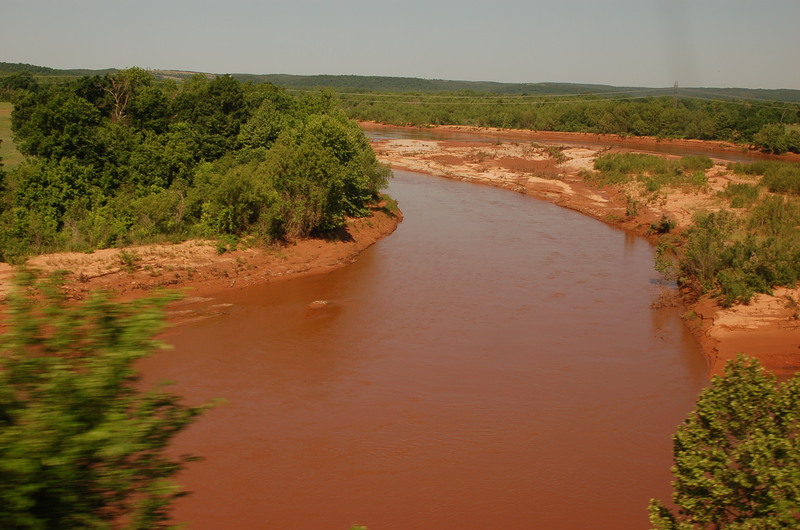 Oklahoma's rivers and streams are characterized by broad, sand- or clay-filled channels. An active watercourse occupies only a small portion of a riverbed or flood plain. Sediments in these flood plains were deposited during major floods that occurred through time. With the development of many man-made dams on the major rivers and their tributaries, the frequency and magnitude of flooding is decreasing; this causes gradual stabilization of the active watercourses within the flood plains. Oklahoma is totally embraced within two large drainage basins, those of the Red River and the Arkansas River. These two, and their many tributaries, flow into Oklahoma from all six of the state's neighbors. However, all surface water leaves Oklahoma by way of the Red, Arkansas, and Little rivers, and Lee Creek. Most rivers and tributaries flow generally to the east and southeast across Oklahoma. Among the special aspects of the state's watercourses are its six scenic rivers in the east and the several natural salt plains and saline rivers in the west. The Red River and its tributaries drain Oklahoma's southern one-third, with a total drainage area of about twenty-three thousand square miles. The main stem of the river begins in eastern New Mexico, travels across the Texas Panhandle through Palo Duro Canyon, and marks Oklahoma's southern border (for 517 river miles) with Texas. It then flows through Arkansas and into Louisiana, joining the Atchafalaya River before entering Atchafalaya Bay and the Gulf of Mexico. At the southwest corner of Oklahoma, the primary branch is called Prairie Dog Town Fork Red River. Two miles to the east it is joined by Buck Creek and from that point eastward is officially titled the Red River. Predominant Oklahoma tributaries to the Red River (from west to east) are the Salt Fork Red, North Fork Red, and Washita rivers, all of which contribute to Lake Texoma; others are Muddy Boggy Creek and Kiamichi and Little rivers. All of these have their own tributary systems, and there are many other smaller rivers and creeks that flow directly into the Red. Oklahoma's lowest elevation (287 feet) occurs where the Little River enters Arkansas, some twenty miles north of the southeast corner of Oklahoma (precisely at the southeast corner, the Red River has an elevation of 305 feet). The Arkansas River and its tributaries drain the state's northern two-thirds, with an Oklahoma drainage area of approximately forty-seven thousand square miles. The river starts in the Rocky Mountains of central Colorado and flows eastward across southeast Colorado and then through western and central Kansas. Turning southeast, it enters Oklahoma in Kay County, north of Ponca City, crosses northeastern Oklahoma, and leaves the state at Fort Smith, Arkansas. The Arkansas River continues southeastward to its confluence with the Mississippi River, which then flows to the Gulf of Mexico. In Kansas the river is pronounced "Ar-KAN-sas," but it is pronounced "Arkansaw" (the same as the state) in Colorado, Oklahoma, and Arkansas. Major tributaries to the Arkansas River include the main Canadian River (often called the "South" Canadian), the North Canadian River (called Beaver River in the Panhandle, west of Wolf Creek), and the Deep Fork, all of which flow into Lake Eufaula; others are the Cimarron, the Salt Fork, the Caney, the Verdigris, the Neosho (Grand), and the Illinois rivers. There are tributary systems to each of these, and many other rivers and creeks flow directly into the Arkansas. The lowest elevation along the Arkansas River (385 feet) is at Fort Smith. The Oklahoma Legislature has designated six free-flowing streams as "scenic rivers," protecting their beauty and recreational value. One is in the Red River system—the upper part of Mountain Fork, which flows into Broken Bow Lake in McCurtain and Le Flore counties. The others are in the Arkansas River system and are located in Adair, Cherokee, Delaware, and Sequoyah counties; the five include parts of the Illinois River and parts of Flint, Baron Fork, Lee, and Little Lee creeks. Oklahoma salt plains discharge natural brines to the Arkansas and Red River systems. Natural dissolution of bedded salt (halite) occurs at shallow depths in parts of western Oklahoma. This high-salinity brine seeps to the surface, creating a series of natural salt plains or salt flats in some of the state's rivers. The largest, Great Salt Plains, on the Salt Fork of the Arkansas River, covers about twenty-five square miles in Alfalfa County. Others in northwest Oklahoma are the Big Salt Plain and Little Salt Plain, on the Cimarron River, and Ferguson Salt Plain, in Salt Creek Canyon in northern Blaine County. In the Red River drainage, the Chaney, Kiser, and Robinson Salt Plains are on Elm Fork in northern Harmon County. Salt content degrades the river waters, occasionally making them unsuitable for industrial, municipal, or irrigation uses in parts of western and central Oklahoma. Kenneth S. Johnson, "Rivers and Streams," The Encyclopedia of Oklahoma History and Culture, https://www.okhistory.org/publications/enc/entry.php?entry=RI014.